Analyzing Data: Did LeBron James Play Significantly Worse in the NBA Finals? Whether we're talking about sports or the best way to improve a process through Lean Six Sigma, it's good practice to verify things you "know" with some data. Quick and easy data analysis sometimes reveals that what everyone took as common knowledge just isn't true. On the other hand, looking at data also can confirm your suspicions. For example, it's no secret that LeBron James didn't play well in the 2011 NBA Finals. He averaged only 17.8 points per game, almost a full 9 points less than his regular season average of 26.7. But is this difference statistically significant? After all, it was a small sample size of only 6 games. Everybody can have a few bad games. Did James just pick a poor time to have a few random bad games in a row, or did something happen in the finals that made him play significantly below his average? I'll use Minitab's 2-sample t-test to find out. I collected the number of points James scored in all 79 games he played in the regular season and the 6 he played in the NBA Finals. Then I used Minitab's 2-sample t-test to compare the mean of his points scored in the finals to the mean of his points scored in the regular season. To make our decision, we need to look at the p-value. Because our p-value is less than the chosen significance level of 0.05, we can conclude that James's average in the NBA Finals was significantly less than his average in the regular season. Another interesting note is that James's standard deviation was greater in the regular season than the Finals. This means that not only did James perform worse in the NBA finals, but he was worse with greater consistency than during the regular season. So what happened? Defenders of LeBron might say he was too busy getting rebounds and distributing the basketball. But his rebounds per game and assists per game in the Finals are similar to his regular season numbers. However, there's two statistics that are significantly different. Field goal attempts, and free throw attempts. The main cause of James's Final woes was that he didn't shoot as much, and he didn't get to the free throw line as often as he normally does. He averaged about 4 fewer field goals per game, and 5 fewer free throws. Considering he hits about 50% of his field goals and 75% of his free throws, that lack of shooting cost him about 7.75 points per game. And he wasn't making those 7.75 points up with extra assists or rebounds. What Do these Statistics Indicate? So why didn't LeBron shoot the ball? The popular theory is that he was afraid, and cracked under the pressure. Maybe, but he wasn't afraid to shoot it against Boston or Chicago. In those two playoff series his points, field goal attempts, and free throw attempts were all equal to or greater than his regular season averages. Wasn't there just as much pressure in those games? That's why it's more likely that Dallas's defense was the problem. The Mavericks were simply able to defend against LeBron like no other team was able to in the postseason. The lack of free throws shows that Dallas didn't let LeBron get to the rim very often. And when he did, the Mavericks were able to contest his shot without fouling. Perhaps they learned from the 2006 Finals, where Dwyane Wade made a living at the charity strip, averaging over 16 free throws per game. But no matter if it was lack of effort by James or good defense by Dallas, the fact is that LeBron James's significant lack of production in the NBA finals greatly aided the Dallas Mavericks in obtaining their first NBA Championship. 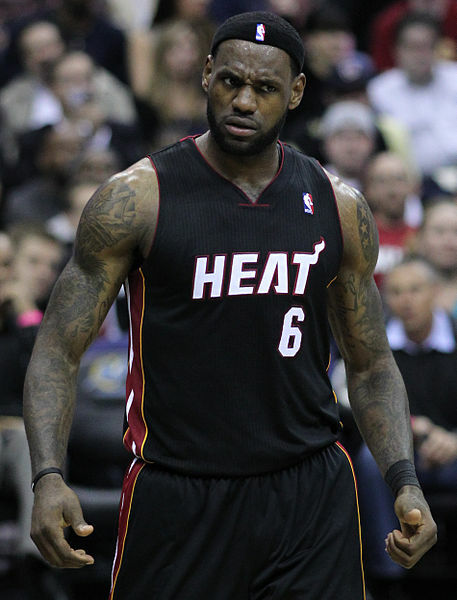 Photograph "Lbjheat" by Keith Allison. 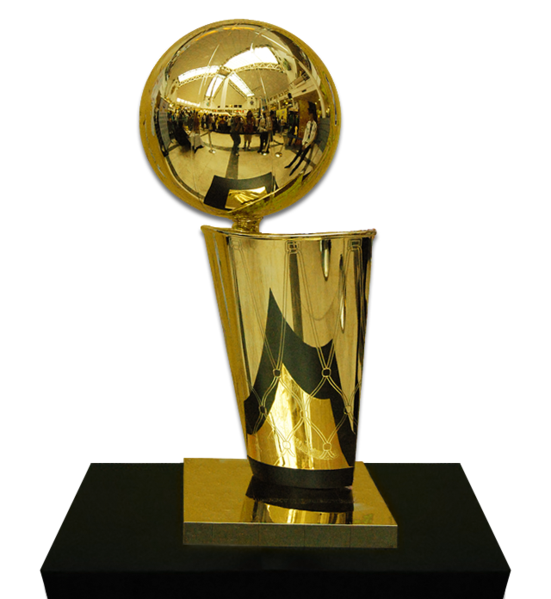 Photograph "NBA_Trophy2" by Joe Johnson. Both images licensed under Creative Commons Attribution ShareAlike 2.0.